If you ever ask a table full of Argentines how to make beef empanadas, you'll get as many different tips as there are people at the table. "Put sugar!" "No, no sugar!" "Chili pepper!" "No!" "You need the meat from THIS part of the cow! (pointing to the upper back)" and one of my personal favorites, "Add a cup of lard!" It has been my goal to listen and synthesize the advice (minus the lard suggestion), and over time I came up with this recipe. Click HERE for the pastry and assembly instructions. You may have leftover dough using these amounts, so you could increase everything by 1/3 OR use the rest of the dough for another kind of filling. 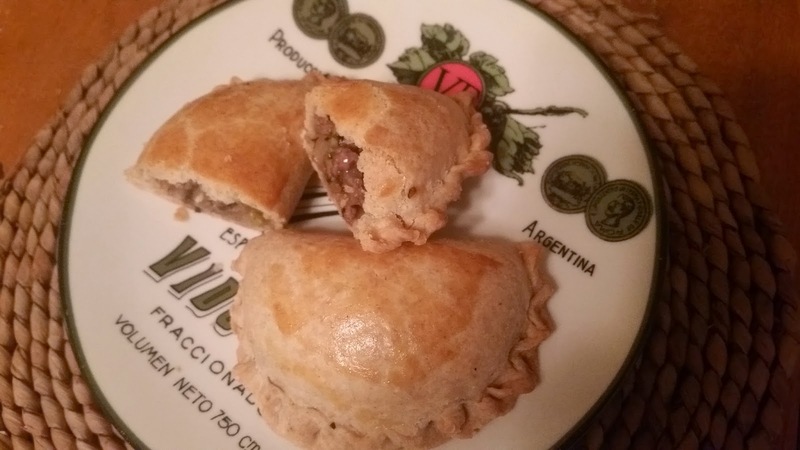 These days you can find the pastry in a lot of Latin or Italian markets in the freezer. 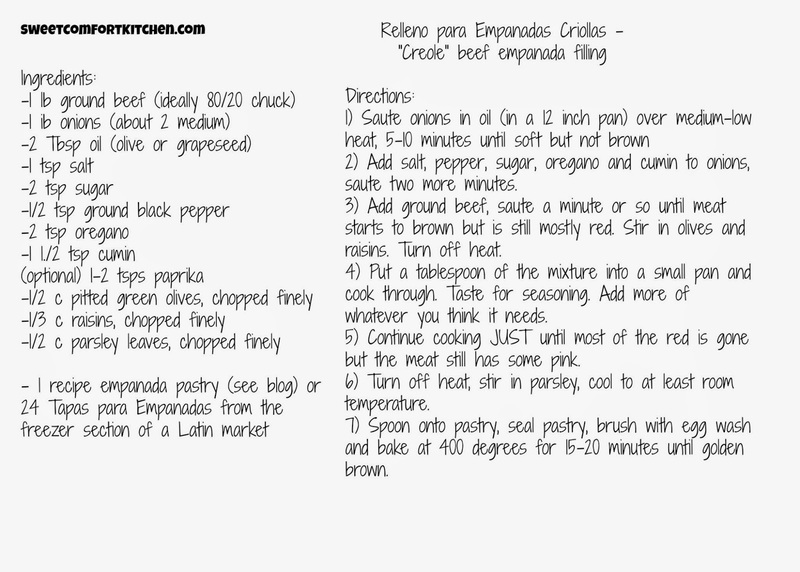 The package will say "Tapas para Empanadas". The two main variations are usually "saladas" or "dulces", meaning "savory with olives" or "sweet with raisins". My favorites were always the "Criollas", which as the name implies are a mix of both styles. 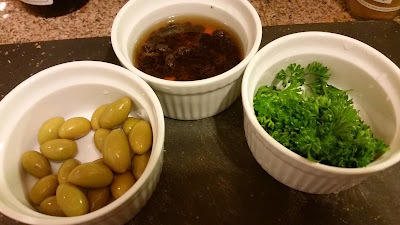 Some people are funny about raisins and olives, though, so I chop them up very finely so the flavors are all there without the textures taking over. Dice 2 medium onions (about 1 lb by weight). 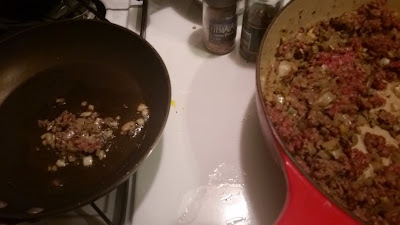 Saute in 1 or 2 Tbsp oil over medium low heat for about ten minutes until soft. It's OK if they caramelize a little, but you don't want much browning. Before the onions finish cooking, stir in 2 1/2 tsp oregano, 1 1/2 tsp cumin, 1 tsp salt, 2 tsp sugar (I heard you, Tio Placido! 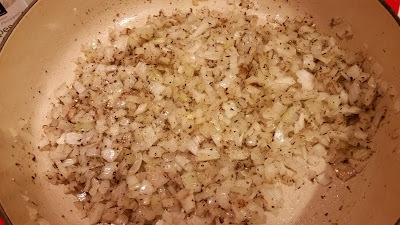 ), and 1 tsp black pepper. If you like, you can also add a couple of teaspoons of paprika or cayenne. Meanwhile, pour a little hot water over 1/3 c raisins to plump them up. Drain and mince the raisins. 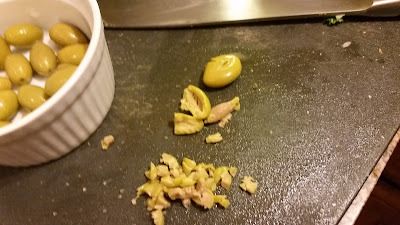 Mince 1/3 to 1/2 c pitted Spanish or French green olives, depending on how strong they are. Mine were pretty mild, so I needed more. Chop 1/2 c parsley leaves finely. Set these ingredients aside for the moment. Crush each olive with the side of your knife, remove the pit, and then chop finely. 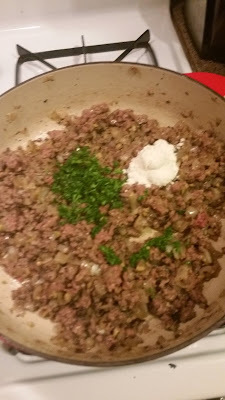 Keeping the heat on medium low, stir in 1 pound ground beef, ideally grass-fed chuck or 80/20 (I gotcha, Enrique! ), but you could use extra lean or even turkey if you wanted to. Stir in the olives and raisins. You just want to mix and cook until it starts to brown a little bit, then turn off the heat. Set up a small pan on another burner to cook a little bit through to safely test the seasoning. Err on the side of over seasoning since it's going inside a pastry. Stir in more of whatever you think it needs. When you're happy with the seasoning, turn the heat back on and cook the filling until all the red is gone but a little pink still remains. It will finish cooking in the oven when you put it in the pastry! Finally, stir in the parsley and 1 or 2 tablespoons of flour. The flour is the latest bit of advice I've collected...thank you, Orlando! It helps thicken the juices so they don't ooze out of the pastry when you bake! Let the filling cool at least to room temp, preferably a little chilled in the fridge, before you put it in the pastry. If it's too warm, it'll be too hard to seal the edges of the dough. Roll out and fill the dough according to the directions in the pastry recipe. Bake at 400 degrees until browning as in the photo at the top. 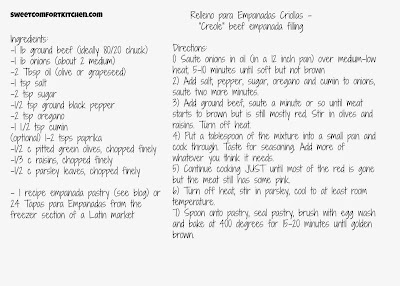 Right click on the recipe card to save and print from your computer.